Companion piece to the Cinnaman & Jay Scarlett compiled Beat Dimensions Volume 2 series featuring two tracks not on the previous three twelve inches. That makes 18 tracks in all if you collect 'em all. 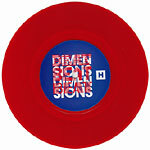 Limited red vinyl.